We will go over 3 different brewing methods for home, to how to perfect the art of brewing a perfect cup! You will have an opportunity to taste the difference between the brewing methods and how they can affect the final cup. We are looking forward to sharing our coffee passion with you! 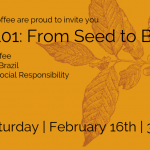 Our tradition began four generations ago, when my great-grandfather started our family’s first coffee farm in Brazil. His endless dedication to superior quality coffee, integrity, and sustainability have inspired our work and made us who we are today. We believe great coffee is much more than just coffee—it’s about true connections. This event is free for VLACC members. Membership is $10 and can be paid at the door. Due to limited space registration is mandatory. Register by email to lili@vlacc.ca.